Around the world, thousands of people are currently mobilizing to demand more and better from governments and corporations. By the end of the week, it may be millions. 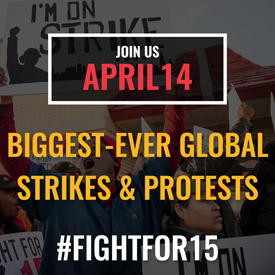 Organizers of the Fight for $15 are planning the biggest global strike ever on Thursday. Building off momentum of successes in the campaign to ensure a $15/hour wage for all workers in the U.S., workers, especially in the fast food sector, will walk off the job to protest low wages, which contrast sharply with the huge profits these companies make. And in Washington D.C., a massive nonviolent action is underway to “save democracy.” More will be gathered there by the end of the week to demand that big money stay out of politics and that there is a fair hearing for President Obama’s Supreme Court nominee. Real democracy is a necessary pre-curser to a just economy and this is the type of grassroots organizing that is needed to bring real democracy. It is an exciting time and a hopeful step towards a more just economy.